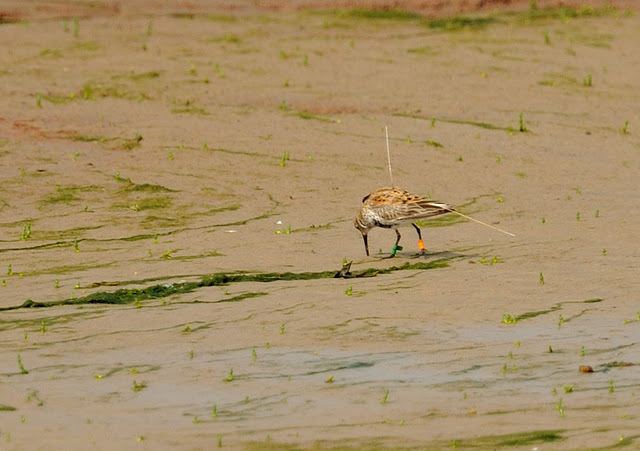 I took this shot of a Dunlin amongst of flock of around 200 at Hayle Estuary back in early May 2011. I found this obvious bird with its' bright leg rings ( double orange rings on the right leg, green flag on the left), but on closer inspection, I could see a vertical aerial stuck to its' mantle plus a second aerial attached to the tail. Mark Grantham has now confirmed that this bird was ringed as an adult on 16th March 2011 on the Tagus estuary in Portugal, so a nice record. (Thanks Mark, for the update).